The Native Americans of the northwest Pacific coast carved magnificent vertical columns in cedar. These columns, commonly known as “totem poles,” were only created by tribes living along these coasts: from the Tlingit tribes in southeastern Alaska, to the Haida and Tsimshian tribes along both the mainland and island coasts of British Columbia, as far south as the Kwakiutl tribes on Vancouver Island. While other cultures around the world, from West Africa and Madagascar to New Zealand and Polynesia, have produced vertical columns with carved surfaces, nowhere did they achieve the beauty, the grandeur, or the sheer size of those carved in this region. These great columns are often referred to as “story-telling poles” (Malin 104) because the multiple figures depict or illustrate a narrative. These narratives might recount recent historical events involving members of a particular family or timeless legends involving mythological characters. The Raven pole belonging to a Tlingit tribe in Wrangell, Alaska, for example, depicts a story found among various tribes that explains the origins of the sun and moon. In addition to its aetiological components, the story includes many elements similar to those in narratives from various Western traditions — the theft of fire, the trickster who benefits mankind, and even the virgin birth — and more mundane themes like the danger of spoiling grandchildren. Long ago, the world was covered with darkness. (This story appears with minor variations in many tribes; the summary here includes details from the Tlingit tradition.) Raven grew tired of stumbling around and went in search of light. As he came near the house of an old chief, he overheard the chief talking with his daughter. Raven learned that the chief kept all the light of the world locked away in a box; predictably, he promptly devised a plan to steal that box. He transformed himself into a hemlock needle and landed in the river; the chief’s daughter became pregnant after unknowingly drinking him and in time gave birth to a son — Raven in human form. The chief loved his new grandson greatly. Raven soon began begging for the box as a toy. When his grandfather refused, Raven began crying and screaming and throwing tantrums and pleading for the box. After many days of this, the chief reluctantly gave him the box. Raven immediately changed back to his bird form, carried the box through the smokehole of the house, and placed the light (in the forms of the sun, the moon, and the stars) in the sky. The Raven pole shown in the three photographs above contains this story. It was carved in 1896 for Chief Shakes of a Tlingit tribe, and it stood for eighty-two years before collapsing in a windstorm. After that, a replica was built for a nearby park (Stewart 104). A detailed drawing of each figure on the pole is shown below. Among all the tribes of the Pacific Northwest, the figures depicted on the carved columns follow highly formalized stylistic rules. These rules make the characters on the poles easy to identify. Birds have beaks of an identifiable shape: while carvers have much freedom in depicting these creatures, the raven must have a straight beak and the eagle must have a curved beak. Wolves and bears look similar but can be distinguished by the shape of their teeth and the length of their snouts. Beavers always sit upright, have two large front teeth, and hold a stick in their paws. Other symbols can be added to figures to communicate further details: multiple dorsal fins indicate that a whale is supernatural, and figures with features from two forms (for example, one set of human ears and one of birdlike ears) have the power to transform between those forms. Though these great columns are undoubtedly related to narratives, the exact nature of that relationship is difficult to define. It provides an interesting dilemma for narratological studies. Though the columns are often referred to as “story-telling poles,” the poles do not really tell a story. Someone unfamiliar with the myth of Raven stealing the light, for example, would not learn it by studying the Raven pole in Wrangell. The figures are not arranged in any chronological order like panels in a comic book would be, nor does the pole as a whole depict one particular scene from the story like a painting world. Instead, the combination of characters together seems to suggest a particular narrative — more like a montage-style book cover or a movie poster would (see examples). The narratives related to a column were most likely recited at the ceremony in which it was raised, and even those well-versed in the myths of the culture might not be able to identify with certainty the story depicted without knowing the history of that ceremony. We do not know how long the Native Americans in this region have made such carved columns. The tribes had developed no system of writing and thus kept no records, and the columns themselves (like all wooden objects) decompose and deteriorate. The earliest evidence comes from descriptions made by European and Russian explorers and traders in the eighteenth century. The stylistic rules for the figures appear to have been already established by that time. However, the columns themselves were much smaller and simpler than the familiar columns of the nineteenth and twentieth centuries. Most of the columns stood inside the houses, decorative but also essential components of the houses’ structure. Only a small number of poles stood outside the houses, rarely more than one or two in any given village; these were erected as memorial poles to honor past leaders. The columns at that time do not appear to have been connected in any way to the mythological narratives of the tribe. Contact with Europeans and Russians created conditions that radically changed the art of column carving. The introduction of iron tools and the increase in overall wealth caused by the fur trade increased the efficiency of the carvers, the detail and quality of their carvings, and the demand for their columns. With these changes, the so-called “golden age” of column carving began — roughly one hundred years from the end of the eighteenth century to the end of the nineteenth century. The columns began to display a much larger number of figures, which made them more apt for containing narratives. The Haida on Queen Charlotte Island first began carving these larger and more elaborate narrative poles; the practice then spread in varying degrees up and down the coast. When commissioning a new pole, custom forbade the hiring of a carver from one’s own clan or tribal group. Preferably, the carver would come from another tribe altogether. Completing one of the larger columns of the nineteenth century could take as long as two years, during which time the carver and his immediate family would often live in the patron’s own house. The patron spent a great deal of time communicating to the carver the histories, the legends, and the myths belonging to his family. These carvers, with their many travels and exposure to stories from other clans and tribes, were perhaps the most culturally-aware members of their society. They would also compose songs, perform dances, and speak during important ceremonies. More than just carpenters or craftsmen, they had a rich understanding of the significant narratives of their culture and could then portray those narratives in their magnificent carvings in cedar. Malin, Edward. Totem Poles of the Pacific Northwest Coast. 1994. Portland, Oregon: Timber Press, 1986. Reid, Bill, and Robert Bringhurst. The Raven Steals the Light. University of Washington Press, 2003. Garfield, Viola E., and Linn A. Forrest. Wolf and the Raven : Totem Poles of Southeastern Alaska. University of Washington Press, 1961. Stewart, Hilary. Looking at Totem Poles. University of Washington Press, 1993. 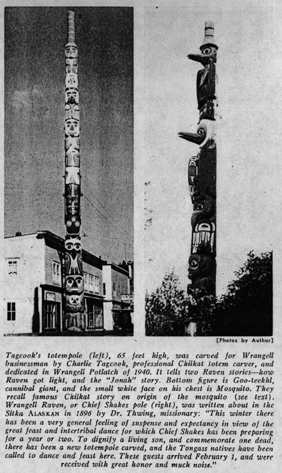 The four images of the Raven pole in Wrangell, Alaska, come from a variety of sources. The word totem comes from an Ojibwa word, nintotem, which means “my family mark.” Each family’s pole contained pictures of the symbols of that family. The western poles are really crest poles named by the priest visiting Ojibwa indians and called them that and the name stuck. You are absolutely right: the carved columns of the Northwest Pacific coast are not properly called “totem poles” at all — the carved figures are not totemic. (Read more about this in the Wikipedia entry for “totem”.) Some scholars have attempted to use a more accurate label for these columns, but the label “totem poles” is now too deeply entrenched. See Malin 5-6 (available at Google Books) for a brief discussion of this issue. Is this all real? i want to know b/c i going to use this in my project for school. don’t worry there is a bibliography. Also for the meanings of the animals are they different for each tribe? Wow a vary intreaging story indeed, thank you know I can finish, my School prodject.